For detailed product information please visit our brand website. 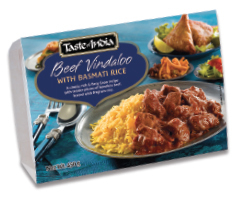 Introducing our ready to eat range of microwavable meals. The range consists of six very popular Indian classic rice and meat rice curries, which are perfectly suited for busy professionals. 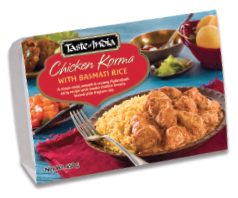 They are convenient and nutritious meals packed in trays with two compartments: one with the boneless meat and curry sauce, and the other with aromatic Basmati rice. 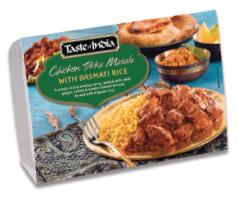 Simply heat in a microwave for 90 seconds to enjoy a tasty meal. They are free from artificial flavours, preservatives, gluten and MSG. A classic mild, smooth & creamy Hyderabadi curry recipe with tender chicken breasts. Served with fragrant rice. 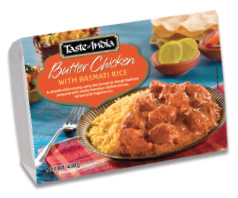 A smooth mild creamy curry also known as Murgh Makhani prepared with tender boneless chicken breasts. Served with fragrant rice. 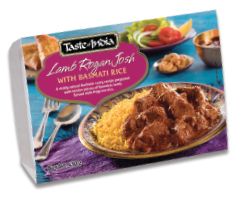 A richly spiced Kashmir curry recipe prepared with tender pieces of boneless lamb. Served with fragrant rice. 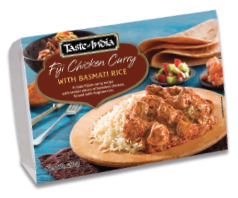 A classic rich & creamy curry, cooked with chilli, ginger, cumin & tender chicken breasts. Served with fragrant rice.